A Cliched cop thriller that just copies ideas from other cop thrillers, such as striking distance, the mediocre bruce willis movie that was still a lot better than this one. 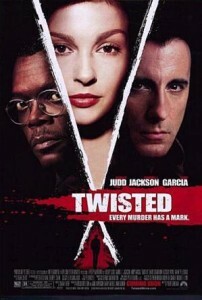 Twisted is a movie that really is based on parts that we’ve seen before. it’s a cop on the case of a serial killer movie, and of course for the cop it’s her first day on the job. nothing like a fish out of water story that makes no sense at all. the killer is targeting only men who she has slept with. so obviously it’s someone that knows her and is very interested in her. all of this is pretty dumb, and it was also done before in striking distance, with bruce willis’ ex-girlfriends getting murdered one after another. in Twisted, no cliche goes unturned, including a wise-cracking new partner (andy garcia) and an older and wiser mentor (samuel l. jackson). the movie does pick up some steam in it’s final act, giving us a decent enough twist that starts digging not only into the plot, but also into the character’s back story. still, it’s too little too late for a movie that was just way too much by the book. Twisted is a movie that has nothing new to offer. It’s very hard these days to make a serial killer movie that is in any way fresh or original. especially when your main characters are cops on the case. and does it always have to be a new cop joining homicide, coming in to a place where he or she has never worked before, and suddenly getting a huge case to be in charge of? don’t the big cases tend to go to the people who have worked there for more than a day? this movie hits every cliche in the book, and yet still manages to hold onto a little bit of dignity. just not very much. each serial killer movie tries to have it’s own thing that sets it apart from the others. 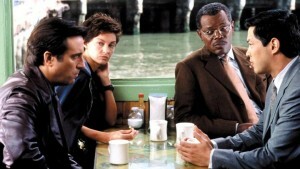 the bone collector featured a bed-ridden denzel washington trying to put the clues together for his partner (angelina jolie) who was out in the field. seven, the meca of serial killer movies (ever since the silence of the lambs), was about two detectives sharing a dark and gritty world of a killer who set up his murder scenes and killed victims after the seven deadly sins. Twisted thinks that it is original because it’s about a woman who is finding out that all of the victims of this new killer were her former lovers. she has slept with each and every one of the victims. there’s only one problem. we’ve seen that before. striking distance, the nineties bruce willis cop movie, was all about a guy who found that the murder victims were all his ex-girlfriends. this was a stupid plot then, and it’s even dumber now. why is the killer targeting people who this hero slept with? who cares about this hero that much? as a movie, it’s also kind of silly because it tells us right away that the killer is someone who this main character knows. the killer will also be a main character, or at least someone who is in this characters life, and that’s giving away too much from early on. ashley judd is that main character. she plays jessica shepard, the new girl in town. by town, i mean on homicide. the movie starts out with her taking down a killer, in a typical, let’s open with something exciting, moment. only it’s not very exciting. leland orser is that killer, and i’m getting a little tired of seeing him appear in these movies, (seven, the bone collector, and now Twisted.) shepard easily takes him down, kicks him in the face, and handcuffs him. and now she’s a hero and getting promoted to homicide. she goes to a bar to have a drink and everyone at the bar shouts at her to do a funny routine, only she does it, and it’s not that funny at all. it’s just her taking out her badge and saying something dumb. and now, at the bar, it’s our time to meet everyone. samuel l. jackson, plays john mills, the head of the police department. he’s also the guy who raised shepard after her parents were murdered. there’s a very cliched moment where he asks her to describe in detail a man sitting all the way at the other end of the bar who she walked by when she came in. and of course, she can do it. now this has nothing to do with anything, other than to show that he has some skills. great. thanks for wasting our time. we also meet another guy at the bar who is a little jerky to shepard. this guy is mike delmarco, played by andy garcia, and guess what? he’s going to be her new partner. when she shows up to work the next day, he will be there, in the office, waiting to be introduced to her. is this really the way people meet their new partners, at a bar, not knowing who the person is? you would think at some point that night, delmarco would actually tell her that he is the guy she will be working with, or at least that he is on homicide too. why wait until the next day at the office? shepard and delmarco start working the case, chasing after dead bodies. 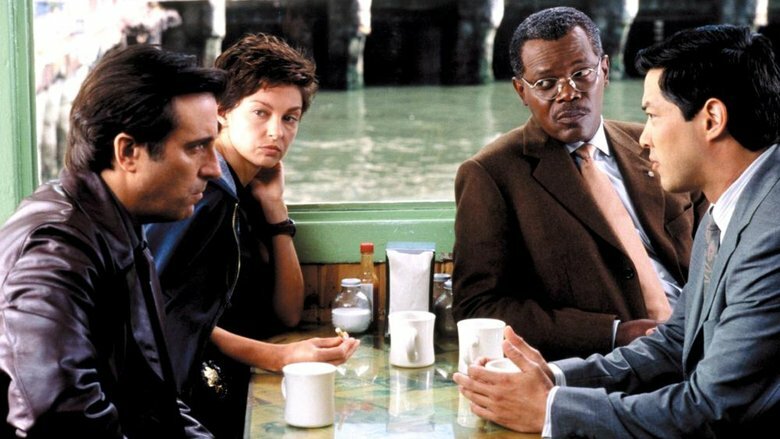 luckily none of the pursuits are too elaborate or drawn out, like they were in the bone collector, so that we never get so tired of waiting that we lose interest. instead, we just get bodies of characters that we have seen throughout the movie. it becomes way too predictable in a paint by numbers kind of way. at a certain point, we start thinking that if we have seen shepard sleep with a character, or even heard that she used to sleep with someone, then that character is going to turn up as a victim. being predictable is never a good thing. luckily the movie does pick up a little in it’s final act. shepard starts convincing herself that maybe she is the one doing the killing. it sure took her long enough to come up with that. she goes out with a guy, gets drunk, blacks out, and when she wakes up the guy is dead. everything points to her being the killer. the first step might be for her to stop drinking so much that she keeps blacking out. as the movie nears its end we finally get two cool plot angles. the first is that shepard’s past comes up and factors into the current plot. it’s been known, sinch early on in the movie, that shepard’s father caught her mother cheating and then went on a killing spree, killing all of the mother’s lovers, and the mother, and then himself. at the end of this movie, some new evidence comes to light about what might have really happened. the other cool thing is that we get a red herring twist. the movie completely leads us into it, never letting us think for ourselves, but we do get a moment where the movie proposes a suspect as the killer and really tries to convince us that the case is solved. if only it let us believe this for a little longer, before exposing the real killer to us, this moment might have actually resonated a little. but instead, we get the real killer coming out, doing his explanation thing, and we’re done. it’s not very creative at all, and yet it happens to be the most creative thing about the movie. Twisted is not a very good film. it does keep you interested, and i do like that the killer was a real character, and not just some random person in the background, but there were just too many cliches. maybe if the characters were written better or the scenes were a little stronger, this could have worked. as it is, ashley judd pulls her gun out on someone in every other scene, and it just gets tiresome.